It is a privilege to offer a view into our school through this page. I hope that it provides a glimpse of the many ways in which we ignite unlimited possibilities for all students. Normont is a great place to learn! We believe in educating the whole child, academically, socially, and emotionally, with understanding of the importance in providing a strong foundation for future development. As a school community, we strive to send our students forward with the skills and characteristics necessary to become responsible, productive adults of tomorrow. Through the collaboration and support of our staff, parents, and students we hold high expectations and standards for all students. We believe that ALL children can learn and prosper. Our instructional practices provide students with a rigorous and fulfilling academic experience. The infusion of collaboration, communication, creativity, and critical thinking skills arm our students for success in a rapidly changing global society. It is our goal to see that each child be provided with unlimited opportunities to reach their fullest academic, social, and emotional potential. In achieving these aims, we need your support to ensure this will happen! Our home-school partnership is the cornerstone to our success. If you are not already involved, we urge you to volunteer at school in a variety of ways: help in the classroom, attend monthly ELAC meetings, participate in School Site Council and/or support our School-Wide activities. Research links parental involvement to student achievement and success. Thanks for partnering with us along this important endeavor. Your time and support means so much and truly makes a difference! We are looking forward to the 2016-2017 school year. 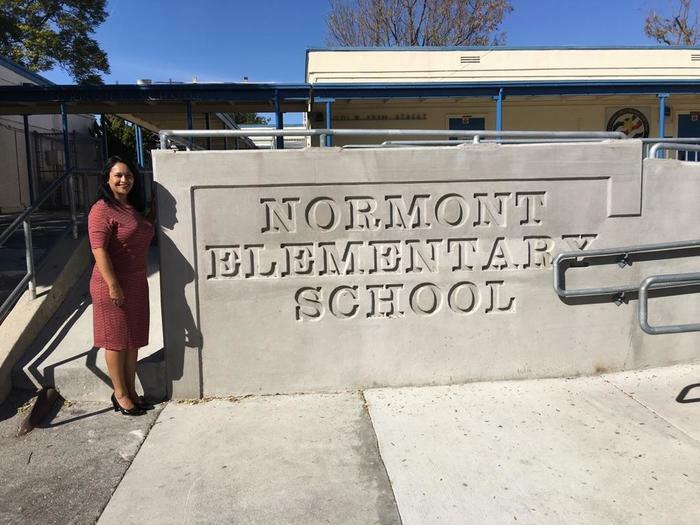 We hope to see all of you actively involved in our Normont Family and we look forward to our ongoing collaboration for the continued benefit of our children! Please explore our website for information about parenting workshops, current school news, information about academic programs, school activities, and calendars. I openly welcome all parents to call upon me at anytime with questions or concerns. Please do not hesitate to reach out if I can assist you in anyway. I commit myself to working with the school community and achieve unlimited success!